Over the centuries, henna leaves have been dried and reduced to a fine powder before being mixed with water, to create the paste coveted by people in Africa, the Middle East and Asia. In and around the Tunisian coastal city of Gabes, henna has long been a key driver of the economy -- so much so that the plant is known as "red gold". 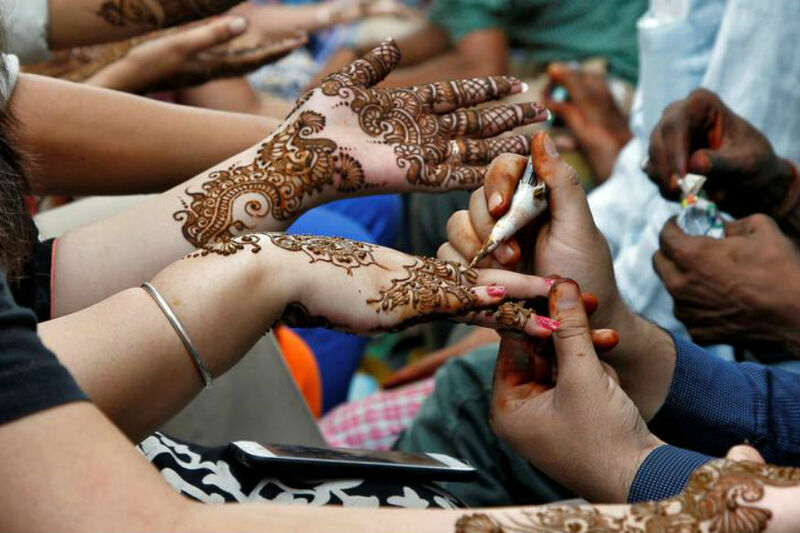 But a water crisis and changing consumer habits are making farmers think twice about planting henna shrubs, despite their coveted leaves that have for centuries been ground down to paint nails, tint hair and ink temporary tattoos, especially for weddings. "Gabes is dying because of the lack of water," says farmer Houcine Akrout, as he digs intricate channels around his green plants to maximise water flow in the early morning sunlight. Akrout is hard at work, because the local water supply will today run from a canal onto his land -- a rare thing nowadays, due to government rationing. [post_ads]Urbanisation and rapidly rising demand for water from industry and agriculture have put immense pressure on Tunisia's water reserves, according to the World Bank. And a 2016 study of Tunisia's water services funded by Sweden's government found that losses from the irrigation network reach 40 to 50 percent. For farmers like Akrout, that means waiting 15 to 20 days for access to the water supply. "It's very long for the henna plant which needs lots of water," he tells AFP. The situation is so bad he has uprooted most of his henna shrubs and replaced them with pomegranate trees -- a much less thirsty species. "Henna does not make me any money," he says noting, "It isn't profitable any more and I need to live and support my family." When it comes, the water supply costs 2.8 dinars ($1.10, 0.93 euros) per hour. In mid-summer, the wait can reach up to 40 days, admits Amel Ghiloufi, head of the region's plants department at the agriculture ministry. And pollution of the water supply from a chemical plant has seen farmers abandon land in the oasis on the Mediterranean coast in recent decades. The water crisis is having a dramatic impact on henna output. Only 645 tonnes of the plant were harvested in the Gabes region in 2016/17 - down 20 percent from the previous season, Ghiloufi says. But other factors, including a labour shortage, are also driving the long-term decline. And it's not only supply side pressures that undermine the market -- demand for local henna is also falling, as people opt for foreign alternatives. Over the centuries, henna leaves have been dried and reduced to a fine powder before being mixed with water, to create the paste coveted by people in Africa, the Middle East and Asia. The paste is used to colour hair, palms of hands, arms and feet with simple patterns that last for a month or so. But the process can be messy and people don't always want to keep the art work for that long. So imports of a treated version of henna from Sudan, Yemen and India are increasingly popular, with added chemicals limiting penetration of the skin and making it easy to wash from hands. Ahead of weddings, the ready-to-use dye is handed out in decorated boxes to guests at bachelorette parties. The processed imported versions are taking over from the local product. And while once popular as a grandmother's remedy for anything from migraines to skin problems, younger people are more sceptical of henna's healing powers. But for Ghiloufi the only way "to revive the sector is to break new ground", by promoting henna's natural benefits and diversifying into new markets. In the capital Tunis, shampoos based on the plant have begun to find their way into health stores. Only a few entrepreneurs sell Tunisian henna abroad -- and they do so without state support -- so exports are minimal, despite the "good quality" produced by Gabe's farmers, says Ghiloufi. In Jara, the main tourist market in the centre of Gabes, huge stalls overflow with henna and incense -- but the streets are empty. Traders complain that the trickle of tourists is not enough to compensate for locals' disinterest. "Henna is sold all the year round. Our market was always full of clients who come from all over Tunisia!" says 85-year-old Hassen Mrabet, who has been growing and selling henna for half a century. "Now sales are limited to the wedding season in July and August," he adds. Another trader bemoans the rising popularity of other beauty products and treatments, as lifestyles change. New forms of "dye and manicures have replaced henna today", according to 49-year-old Ismail. "Tunisians have changed their habits and turned their backs on their traditions; henna is out of fashion."